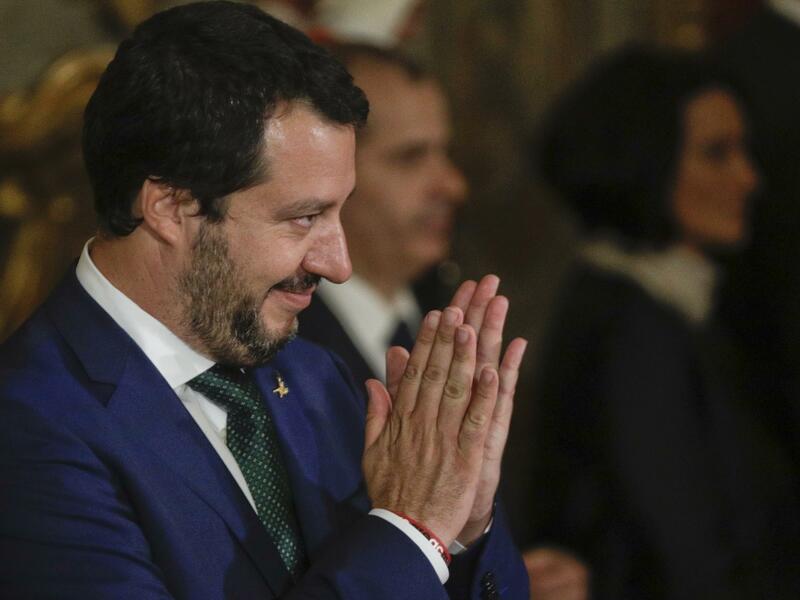 New Italian Interior Minister Matteo Salvini applauds during the swearing-in ceremony for Italy's new government in Rome on June 1. He has promised to deport migrants. European Union leaders wrangled over migration policy reforms in an all-night meeting in Brussels. And one of the bloc's newest and loudest critics, the barely month-old government of Italy, is claiming a big win. In the early hours of Friday, the EU states said they agreed on a package of plans, which included key demands from Italy: more support for "front-line" entry countries, stronger efforts to counter human smuggling and the establishment of more centers for holding and processing asylum-seekers. Italy is a front-line country for immigrants and refugees crossing the Mediterranean to Europe. Its populist leaders oppose a rule that says the country where migrants first land is responsible for determining whether to let them stay. Italian Prime Minister Giuseppe Conte — in his government's first major EU summit appearance — had threatened to veto any deals if his country did not get more help with migration issues. He sounded satisfied with the outcome. "Italy is no longer alone," Conte told reporters as he left the meetings Friday. The Italian populists' rise to power, analysts say, came largely because of a sense among voters that Italy has been abandoned by its EU partners in handling the migrant crisis. But it's one of Conte's deputies — Interior Minister Matteo Salvini — who has emerged as a powerful hard-liner shaping the country's anti-immigration stance. In office less than a month, Salvini has dominated the national spotlight and thrown down the gauntlet to the European Union. He has said Italy is ready to renegotiate its financial commitments to the EU if more is not done to help the country deal with migration. As leader of the right-wing League party, Salvini campaigned on the slogan "Italians first" — with clear echoes of Trumpism, which he endorsed early on — and pledged to deport 100,000 undocumented migrants in his first year in office and to expel hundreds of thousands more in the rest of his term. The government has turned away hundreds of migrants on rescue ships this month. But kicking out people already in Italy has proved difficult. More than 600,000 migrants from dozens of countries have landed by sea in Italy since 2014, according to United Nations data. Many have applied for asylum. Italy rejected 42,000 asylum claims last year, according to the Asylum Information Database website. But the country expelled a little more than 7,000 migrants in 2017, The Associated Press reported. The news agency said many of the migrants' home countries lack diplomatic agreements with Italy and are unwilling to take deported citizens back. But Salvini has repeated his vow to expel undocumented migrants. He is one of Italy's deputy prime ministers as well as its interior minister — a key domestic security post overseeing law enforcement. Within days of taking office on June 1, Salvini ordered a block on docking rights to Aquarius, a humanitarian relief ship carrying more than 600 migrants rescued at sea. The ship, which was off Italian waters, ultimately found refuge in the Spanish port of Valencia after several days sailing in rough seas. Salvini was adamant, saying earlier this month that "if anyone in the EU thinks Italy should keep being a landing point and refugee camp, they have misunderstood." "The plan's aim is to care for Roma children who," Salvini claimed in a Facebook post, "are brought up into a life of crime." Human rights activists in Italy are furious. They have pointed out that about half of the estimated 120,000 to 180,000 Roma population in the country are Italian citizens. Speaking of Roma who are Italian citizens, Salvini said, "unfortunately, we have to keep them." The Italian Constitution bans taking a census based on ethnicity. Moderate and leftist Italian politicians said the census idea recalled late 1930s fascist-era laws persecuting minority groups including Roma and Jews. The Roma census proposal was a step too far even for Salvini's government coalition partner and fellow deputy prime minister, Luigi Di Maio. "We can't do it," Di Maio, the leader of the 5-Star Movement, said of the proposal. "Let's start working on the problems of millions of Italians who can no longer eat." Despite accusations of racism and xenophobia by critics on the left, Salvini is emerging as the dominant figure in Italian politics. Only a few months ago, he was considered a marginal candidate. But in the March 4 general election, the League party won 17 percent of the vote. The 5-Star Movement scored 33 percent, but that was not enough to govern alone. So it joined forces with the League to form a government. Since March, the League's popularity surged to more than 29 percent in a recent poll. It has been quite a ride for Salvini since his political career began in the 1990s, in what was then called the Northern League, a secessionist group that blamed southern Italians for the country's economic problems and corruption. In 2013, he took over the party leadership and dropped "Northern" from its name. He sought to rally all Italians and shifted the focus to negative impacts of globalization, income inequality, joblessness, resentment toward EU regulations and, most of all, fears deriving from a perceived surge in migrant arrivals. Salvini adopted slogans of the neo-fascist group CasaPound Italia, such as "Italy for Italians." In a short time, Salvini has become one of the most prominent European champions of populist and nativist policies, Euroskepticism and what is called "sovereignism," the doctrine of maintaining independence from international associations such as the EU. His strongest allies outside Italy include Nigel Farage, the promoter of Brexit in the U.K., France's hard-right leader Marine Le Pen and Hungary's increasingly authoritarian and anti-immigrant leader Viktor Orbán. Steve Bannon, President Trump's former chief strategist, hailed the creation of Italy's new populist government. "The Italian people have gone farther, in a shorter period of time, than the British did for Brexit and the Americans did for Trump. Italy is the leader," he said in March, according to The New York Times. On Tuesday, Salvini tweeted a photo of himself shaking hands with John Bolton, Trump's national security adviser, and wrote that the two engaged in "sharing on issues of combating illegal immigration and terrorism." One of the administration's adversaries, meanwhile, is the government of France. President Emmanuel Macron has warned of what he sees as the dangers of populism spreading across Europe. "You can see them rise a bit like a leprosy all across Europe, in countries where we thought that would be impossible to see them again, in neighboring countries," Macron said on June 21. Without mentioning Italy by name, he added, "They're saying the worst things, and we're getting used to it. They're making provocations, and nobody is horrified by that." But this week in Brussels, France and Italy apparently saw eye to eye on some things. As talks went into the wee hours, Bloomberg even said it was "Macron's bow to Italy" that made Friday's deal happen. For now, the populists are relishing an early victory. "I am satisfied and proud about the results our government achieved in Brussels," Salvini said Friday in a statement. "In contrast to nothing" achieved by previous Italian governments, he continued, "many of our requests were accepted. On others, there is still work to be done. But finally Italy has emerged from isolation and is once again a player."